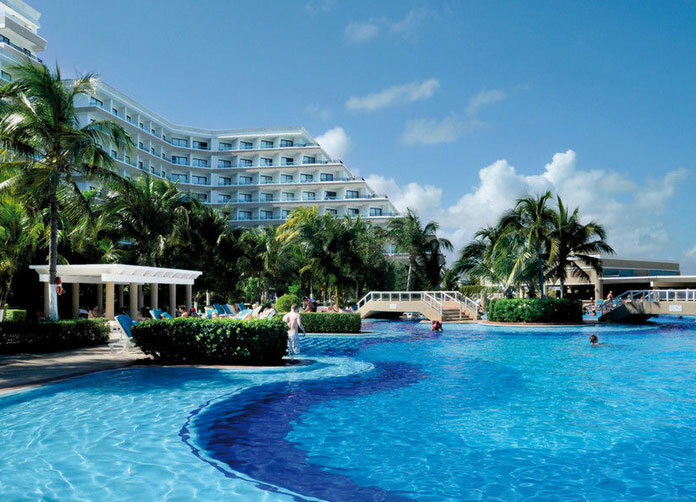 If you’re looking for the best in-class resort complex that not only delivers but supersedes all the others – then look no further, you can’t get better than Riu Caribe Cancun. 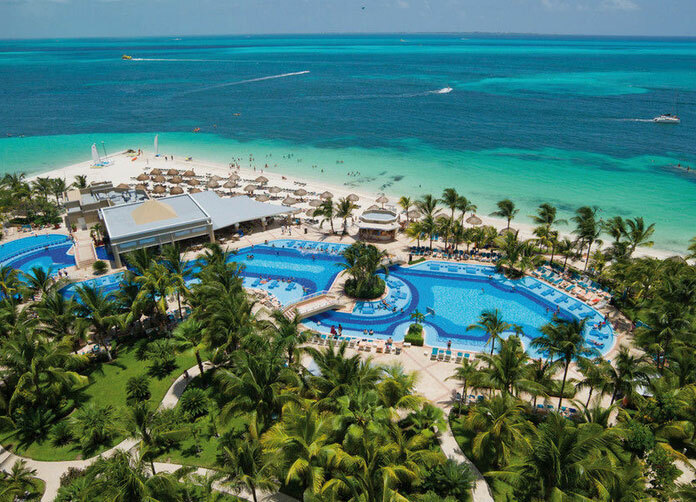 Looking more like a mini amusement park from a distance nestled lightly on a blanket of white sand surrounded by the luscious Caribbean, the Riu Caribe will leave an effect on you lasting well into your re-emergence into regular day-to-day activities. 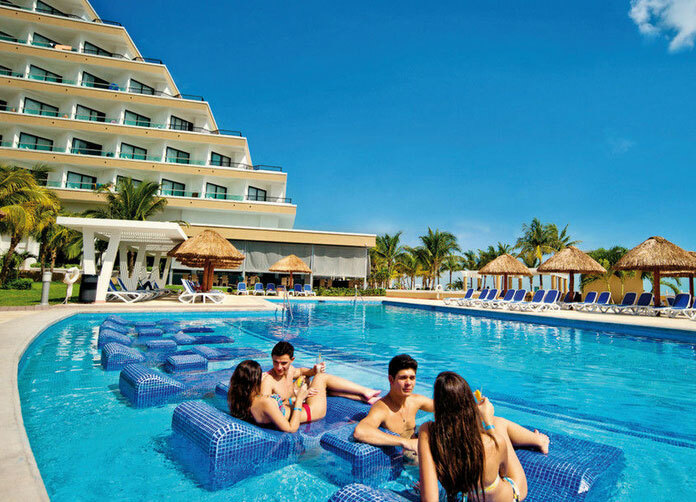 Situated 20 minutes away from downtown Cancun and 15 from the party center, The Riu Caribe’s excellent location brings you to the heart of the Caribbean and closer than ever to the shopping, the culture and the nightlife. It’s not surprise the feature that sets this resort complex from all the others is its exceptional service, while holding high standards at the Riu Caribe Cancun and not missing a detail with its menu of activity and extensive restaurants they have to choose from – but we’ll touch on those in a moment. 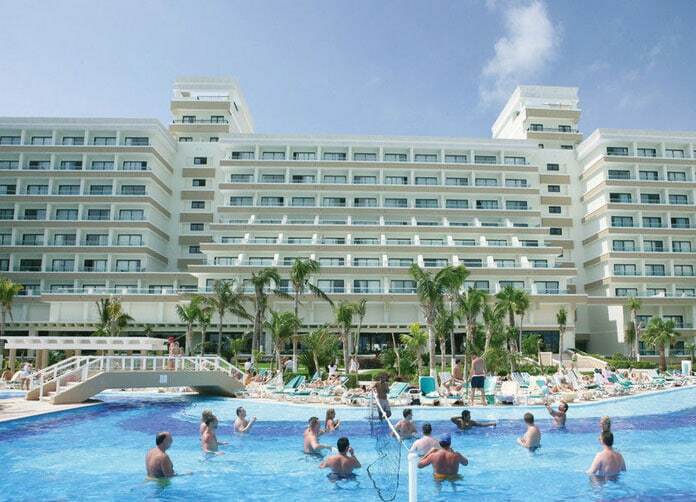 Since the staff behind the masterpiece of Riu Caribe are known for their prestige and high level of service this location will also suit groups and conventions of all kinds; whether you came with a bus loaded with co-workers or looking for the ultimate vacation that Cancun has to offer, this could very well be your ‘dream vacation’. 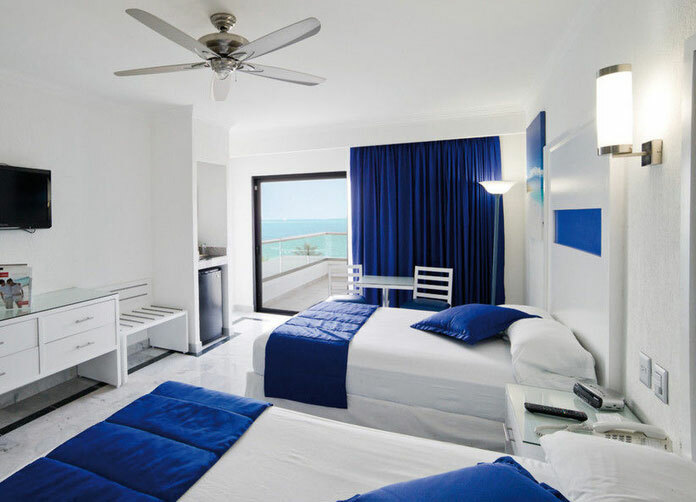 With 506 rooms of pure luxury you will feel like you’re walking amongst the clouds suspended twenty-seven thousand feet in the air; somehow all this care into your room will seem more like a waste as you’re enjoying everything the Riu Caribe has to offer. Swim in the pool which is as navy blue as the Caribbean which surrounds it, or stretch your muscles to the extreme with the full service gym, kayak’s, many water activities which include but aren’t limited too; jet skiing, wind surfing, scuba diving and much, much more. If you came to relax, you’ll feel better than ever after enjoying the giant sauna, great Jacuzzi, or the beauty salon. Also, if you came with little ones, give them a day or two to unwind as well; the Riu Caribe’s Kids Club could only be described as the coliseum of fun: a giant room of vivid colors and crafts galore. While the kids are at the ‘coliseum’ you and yours can enjoy yourselves in the grand pool with a swim up bar – indulge in a couple tropical drinks in an exceptionally casual atmosphere. After a day of being pampered and treated like a queen (or a king) you’ll be ready to dine – and a most gracious dine you shall too. With five restaurants to choose from, you’ll be able to eat at a different place each night, and with choices like these it may be the best option. 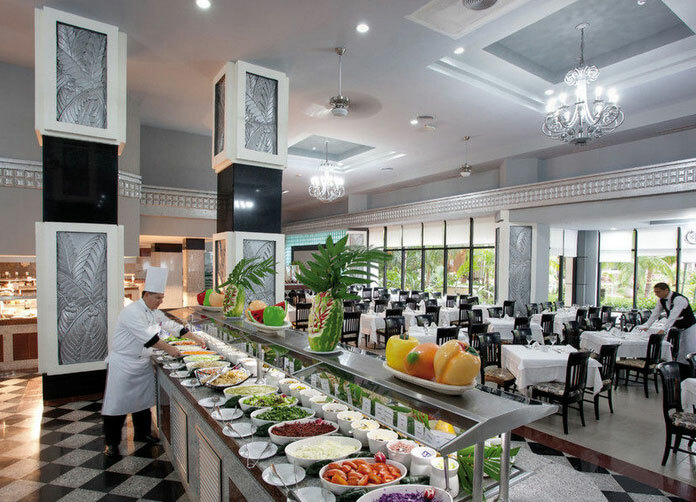 Albatros: This elegant restaurant will swiftly take you into the land of a secret garden with its soft colors and touch of Mother Nature as you enjoy their extensive buffet. Gabiota: Enjoy a meal with the wide ocean breezing through your hair as the sun reaches its retreat before your very eyes. With its unique design you’ll truly be eating on the Caribbean. La Pizzeria: Or for a quick meal, stop at this nice spot to treat yourself to some delicious pizzas. Maria Margarita: You’ll enjoy this romantic setting in one of the Resorts most exquisite restaurants. The grandeur is by far astonishing and its authentic Mexican menu and an exceptional selection of wine – you may want to come to this one, twice. Sangrila Restaurant: Enjoy the best in Japanese foods. Bare in mind however, reservations are required. Address: Blvd. Kukulcan Km. 5.5 Zona Hotelera, Zona Hotelera. Cancun, Quintana Roo. Airport Distance: 24 Km. (15.00 Mi. ).